Takelech conducts due diligence and landscape study processes for new grantee-partners. 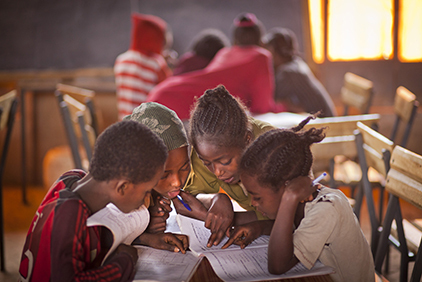 She conducts capacity building and training for Speed School implementing partners in Ethiopia. She also supervises and monitors the successful implementation of the Speed School Program and provides on-the-spot technical support. In addition to these responsibilities, Takelech provides guidance on proper grant management for the implementing partners. Formerly, Takelech has worked with international organizations and managed education and women empowerment programs funded by USAID, World Bank, Japan Social Development Fund (JSDF), and Educate A Child-Education Above All Foundation, Qatar. Takelech has a Master’s degree in Social Work from Indira Gandhi National Open University, Delhi. I enjoy conducting site visits to the Speed School program sites as there are many unintended results obtained because of the program intervention, like increased awareness on importance of education by the students’ family members as they see real change in their child or children. I strongly recommend people to do good things to others without expecting any positive pay back from them.